There is worse than death. For a long while, people have debated this age old question, but, anyone who has been unfortunate enough to end up in Azkaban Prison knows that there is far, far worse. Living forever in the prison is bad enough, but the threat of trying to escape brings fear to any and most would never in their worst nightmares even dream of fleeing, lest they come face to face with the most notorious and fear-inducing monstrosities in the whole of the Wziarding World: the Dementors. These soul-sucking fiends have made it their job to make sure the worst of the worst in the stay behind bars… but they all truly desire for one of the prisoners to try to escape. How else would they look into the soul, strike it with its greatest fear, and then drink up everything that made the person who it might have been? The only thing a Dementor won’t attack is one of their own. So, you could try to find a friendly one and keep it around. Your best bet is to have your own little wizard step into the role with this Kid’s Dementor costume. 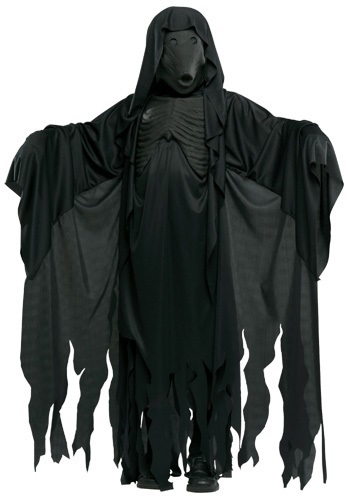 The long jagged fringed robe is dark black with a fabric tie hood and a foam mask of the blank stare of the soul-eaters. Mesh-covered eyes block out your tyke’s face while still allowing basic vision, but the most horrifying detail is the molded chest piece that looks like deflated and dead lungs. Just… freaky! Good luck with your little Dementor. Just ensure that the soul-sucking business doesn’t go too far. It’s a hard unlife to break!